There are chickens. Lots of chickens. So... you wanna go on a quest or something? You'll need an arch nemesis. Don't worry, we'll find one for you. Then you can go out, do some adventuring, solve some puzzles, and maybe find some nice loot. Don't forget to check out the chickens. 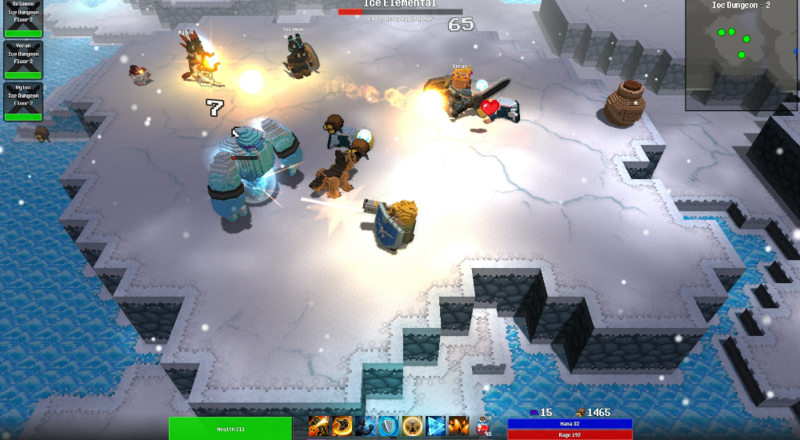 Forge Quest is a randomly generated voxel dungeon crawler with a tongue in cheek sense of humor. You and a party of up to four friends head into the wilderness to do some serious RPGing, which mainly means you'll attack everything that moves, nimbly leap across traps, and gather plenty of loot from the spoils. Oh, and yeah, you'll craft equipment, too. It is a quest about forging, after all. Once you complete a dungeon, you'll push through a rinse and repeat cycle where you dive into deeper, more dangerous dungeons with bigger and badder enemies. You know the drill. Each time you surface you'll be able to boost your equipment to survive a more perilous journey. Co-op supports up to four online players in a mode we'll call "drop everybody in the game and let them do their thing". Also, Forge Quest is proud of its voxel chickens. Really proud. Be sure to pick them up and carry them around for awhile. Except Cluckins. Don't try to pick up Cluckins. Page created in 1.1211 seconds.